Welcome To The Best Pokies! Will Colorado Vote for Gambling Expansion? The voters of Colorado have some important decisions to make in regard to state gambling regulations. A bill is in place that would allow people to gamble on casino games at horse racing tracks. One horse racing track is located near downtown Denver, while the two other sites have yet to be selected. Proponents of the bill pledge that the move will raise more than $100 million in state taxes over the next few years. This money will go directly into Denver’s public school system, which is in need of a radical overhaul. A lot of money has been raised on both sides of this argument. A total of $35 million has been collected to both oppose and favor this bill. It is a serious issue and one that has divided people in Denver and the rest of Colorado. The people arguing against this bill claim that the overall cost of the Amendment will be a negative one. They claim that if casino gambling is allowed at the accessible horse racing tracks, fewer people will frequent casinos in the mountain regions of the state. Figures of $100 million being raised from the move are true, but they do not include any potential loss of business for other casinos in the state. Those in favor of the bill believe that there are enough people to go to both types of casinos. Those that prefer horse racing will also be allowed to gamble on card games and slots. 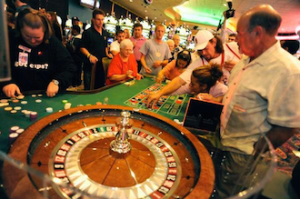 Meanwhile, regular casino goers will continue to frequent those establishments. They believe that the boost to tourism and the state’s economy outweighs any negatives about the bill. The state of Colorado has tried many different things to improve education funding. Last year, a bill was rejected that would have raised taxes to directly benefit the state’s school system. Proponents of this bill argue that if Coloradans are not willing to pay for improvements to local schools, they should allow casino money to do the job. What Is Wildcat Canyon All About?